1927-28: altered and enlarged by Shepley, Bulfinch, Richardson & Abbot [$162,500] - Mansard roof removed, windows altered. Victorian roof line modified to Georgian design. Town of Andover's first public or free town library. On the site of Memorial Hall Library was once two homes and business of Herman Abbott Jr. a cabinet maker who had his furniture business at this location. The property was acquired by the Boston & Maine Rail Road Company, who had purchased the former Andover and Wilmington Rail Road (1835-1848). The former rail line and the depot were directly behind the library until 1848 when the tracks were moved further west down Essex Street to the present location. The relocation was made to provide rail service to the new city of Lawrence then reconnecting to the Haverhill line. The B & M Railroad owned most of the property from Essex Street to Amos Abbot’s house at the corner of Pearson Street. 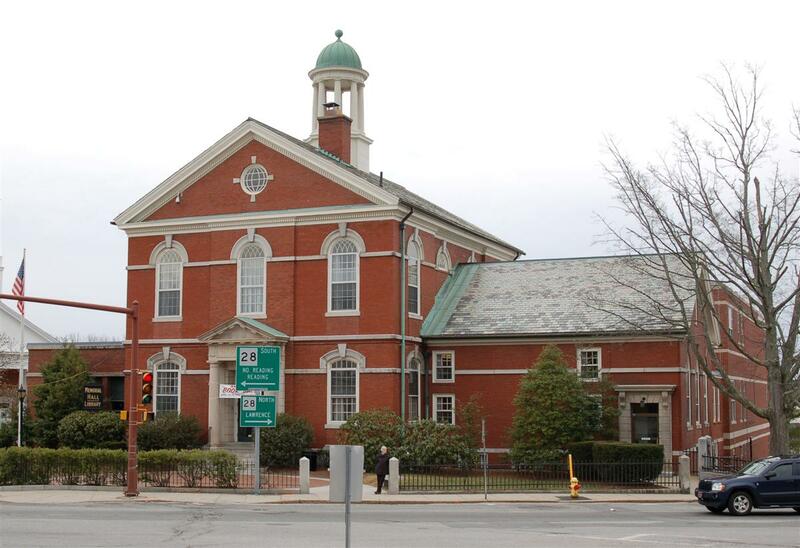 The company began divesting of unneeded property along Main Street, Essex and Pearson Streets and westward down the hill to the Shawsheen River. Nearly four years later Joshua sells half of his parcel #1, one undivided half part the property to Herman Abbott Jr. for $567.09. Joshua Abbott, now of Boston, sells his remaining half to Herman Abbott Jr. in Feb. of 1858 for $1500 subject to the mortgage of $1200 on the whole of the property. Herman Abbot Jr. had also purchased the Crystal Palace building on Pearson St., a former car building and repair shop of the railroad. Oct. 27, 1855 AA– Herman Abbott, Jr. Manufacturer and dealer in Cabinet Furniture – large ad. – Ware rooms opposite the Post Office. March 20, 1858 AA- H. Abbott Jr. – Wholesale & Retail Dealer in Cabinet Furniture, chamber sets, pictures framed, furniture made to order, Repair & painted, coffins & robes made. Opposite the Post Office. 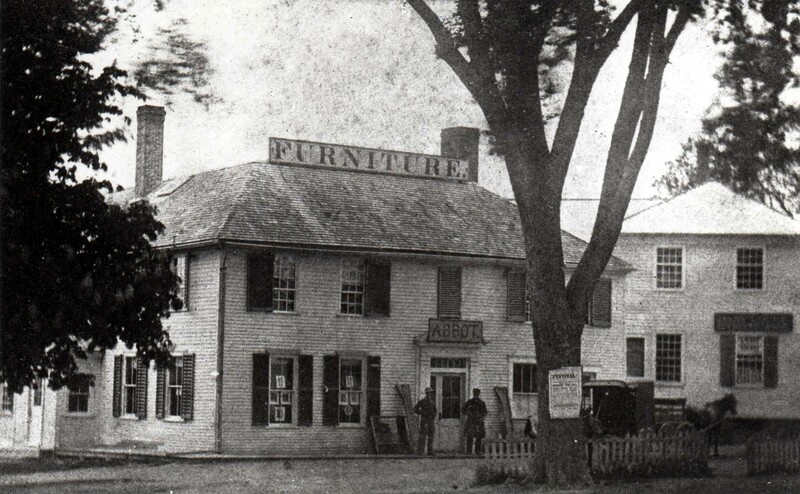 April 17, 1858 AA - WHITE WASHING – by Leonard Bean – order left at H. Abbott’s Furniture. April 16, 1859 AA – Mrs. Springer – will give drawing & painting instruction to small classes for the present at their residences in Andover and vicinity. Her residence over Abbott’s Furniture Rooms, near the Post Office. June 3, 1870 AA – Sunday morning May 29, 1870 a fire completely destroyed the entire block from the corner of Pearson Street south to Elm Square and the corner of Essex Street. “The fire was first discovered just before 2 o’clock, in a barn on North Main Street, owned by the heirs of the late Hon. Amos Abbott, and the flame soon communicated to an old house on the same premises, occupied by Michael McLaughlin, as a tenement, and by Charles Mayer, for a harness shop. Both buildings were entirely consumed, together with a cow and two swine, belonging to Mr. McLaughlin. His furniture and the stock and tools of Mr. Mayer, were saved. The paint shop next south of the above , owned by Eben P. Higgins, was soon enveloped with flames and destroyed with some stock and tools, a wagon left to be painted by George H. Chandler, a sleigh owned by John Findley, three pung sleighs and a lot of oats stored by Holt & Higgins….. The livery stable of John Cornell, with hay, grain and three sleighs shared the same fate. Mr. Cornell saved all his horses, carriages and harnesses. The many friends of “Jerry” and “Jim”, two favorite horses were greatly relieved on learning that they were saved. The fire next reached the wooden buildings of Herman Abbot, on the corner, and they with a portion of their contents, were entirely destroyed. The buildings were occupied by the owner for coffin and picture framing rooms, and by Joseph Abbott, as a residence, and for furniture ware rooms. The principal part of the furniture and other articles were saved, although a large number of coffins, caskets, and fixtures were lost. Herman Abbot's store was then located to the Crystal Palace building at 13 Pearson St., now parking for the Public Safety Building. His brother Joseph Abbot relocated his framing business to the Carter Block at 3 Main St. Herman was in the process of building a new three story building on this cleared lot in 1870 when John Smith envisioned a public library on the site. John Smith, a Scottish immigrant, was a founder & manager of Smith & Dove Co. which manufactured flax thread. His position on anti-slavery was uncompromising. He was a delegate of the Massachusetts Anti-Slavery Society and one of the leaders in the secession from West Parish Church to found The Free Christian Church, and he was active in the Underground Railway in Andover. During a vacation in Scotland, he wrote his son, Joseph, July 2, 1870: "You mention in your last letter received here that there was nothing yet done with lots up town where the buildings were burned. I have thought the corner lot where Joseph Abbott shop stood, would be a fine place for a Memorial Hall to be built upon." He pledged $25,000, "that sum to be matched by other subscriptions, the land and building not to exceed $30,00, with $20,000 to be invested for the library's upkeep". Aug. 1, 1870 AA - John Dove and Peter Smith added $10,000 to the sum pledged by their partner, "provided the town will purchase the lot of land on the corner of Main and Essex Streets, owned by Herman Abbott, where the buildings were recently destroyed by fire." Rev. John L. Taylor served as chairman of the building committee. George H. Torr was in charge of the ground plan. John Byers of New York gave $3,000 for books in memory of Peter Smith Byers, first principal of Punchard Free School. Samuel Raymond, treasurer of the committee, also served as superintendent of erection of building. Needing more funds, the committee remembered that in April,1866 following the Civil War, the town had voted to raise $4,500 for a soldiers' monument. Although the project had been shelved, those funds were now available for Memorial Hall, and appropriate for use. Sept. 2, 1870 AA - Town is negotiating with Herman Abbott to purchase lot at Main & Essex Street- 11,675 square feet, price asked $3930. 3200 sq. feet will be cut off to straighten the street. Sept 16, 1870 AA - Herman Abbott Jr. sells his lot to John Smith for $3000. Mr. Abbott had commenced laying the foundation of a building upon the premises, but relinquished the undertaking for the sake of securing the erection of the “Memorial Hall” as a great public improvement. June 23, 1871 AA - Work on the foundation of Memorial Hall has not yet been commenced. 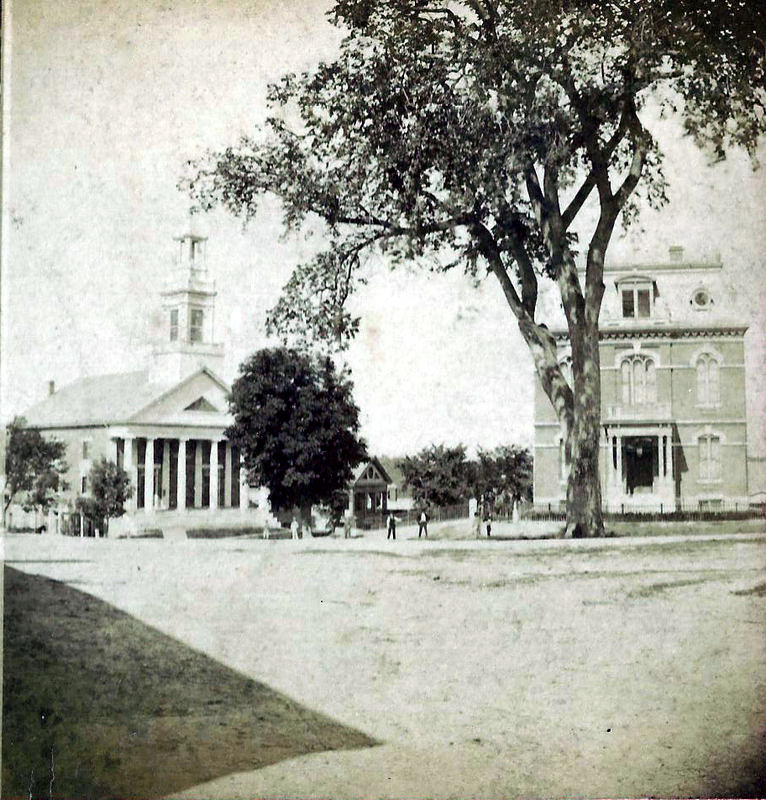 July 14, 1871 AA - Andover Advertiser – Article on Memorial Hall. Architect Mr. J. F. Eaton of Boston – good description of building. Aug. 4, 1871 AA– Abbott & Jenkins have the contract to build Memorial Hall for about $30,000. The Architect is Mr. J. F. Eaton, formerly of Lawrence. Aug. 11, 1871 AA– Frederick Frye of Lowell contracted by Abbott & Jenkins for the brick work on Memorial Hall. Frye has let out the stone work to W. H. Boardman of Lawrence. 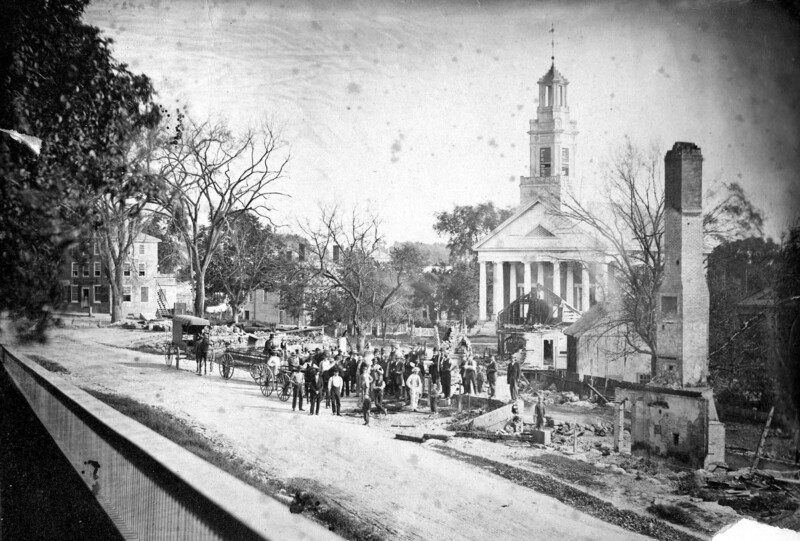 Aug. 19, 1871 – The first stone is laid on Tuesday for the foundation of Memorial Hall. Sept. 15, 1871 AA – Corner stone to be laid soon at Memorial Hall – Tues. September 19th 4 pm. Sept. 22, 1871 - Report on the entire contents placed within the corner stone of Memorial Hall. 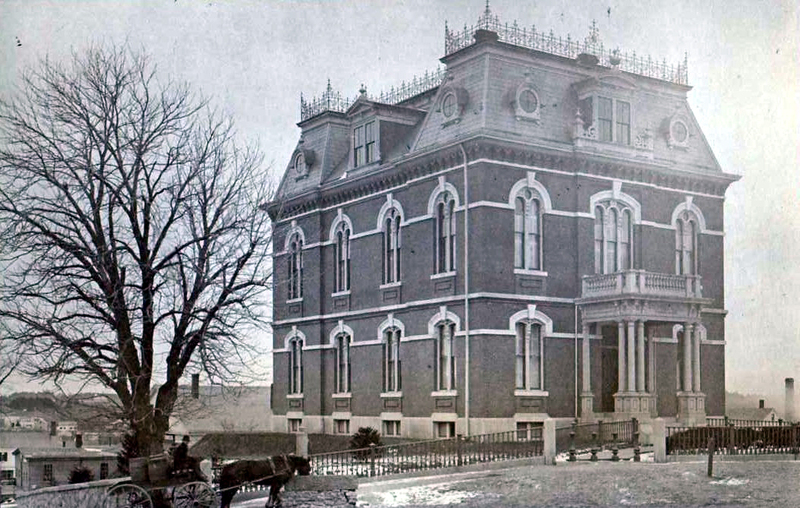 Dec. 15, 1871 – The brick walls of the Memorial Hall are completed and the carpenters are putting on the roof. A few days of comfortable weather will enable them to finish the outside of the building. 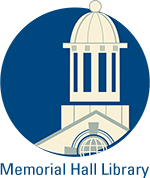 Feb. 21, 1873 – Memorial Hall is to be dedicated on Decoration Day, May 30th. The second floor was kept as a Civil War Memorial Room and meeting hall. The town's loyal Union dead inscribed in marble and relics and records housed there. Oct. 10, 1879 AA - A new pump has been put in front of Memorial Hall, and the stone trough in use there has been elevated and firmly set. It is a great convenience to the public. July 8, 1927 AT– Memorial Hall Library to reopen tonight 7-9 remodeled library cost $90,000. In 1961 a modern rear wing was added as the children's room. The large glass windows filled the room with sunlight and created a cozy place for children to read. In 1968 another expansion and interior renovation took place with the reading wing and study area on the south side facing Central & Essex St. The main room saw a change in location of the checkout desk and the upper balcony book stacks. The current rear wing of the building was added between 1985-87, and the original children's room razed to make way for the addition. The original balcony book stack loft on the west side of the main room was also removed. The "Memorial Hall" on the top floor was restored to its former beauty. The completed building project was dedicated in 1988. 1) Catalogue of the Memorial Hall Library, Andover, Mass. 1874. 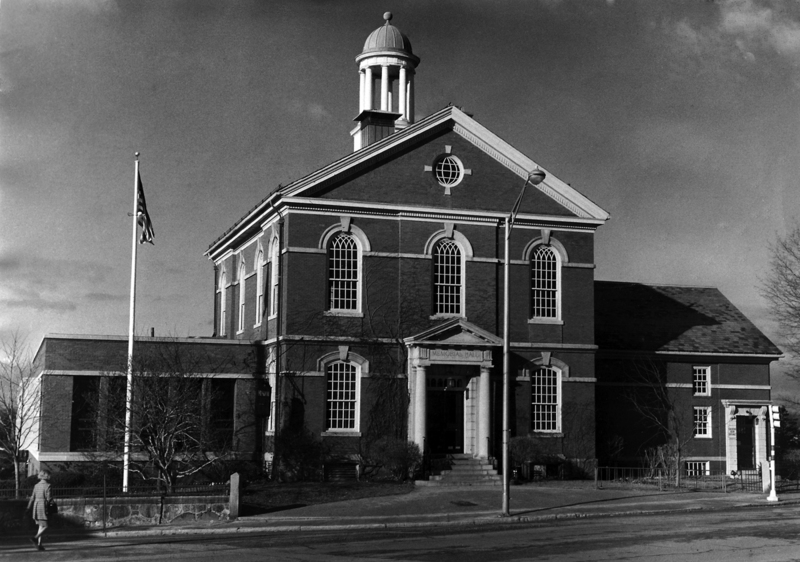 3) (Carpenter, Charles C.] Historical Sketch of The Memorial Hall, Andover Mass. Lawrence: Merrill & Crocket, 1873. 4) Memorial Hall Library: Report of the celebration of the Fiftieth Anniversary of the Dedication. Sunday, May 27, 1923. 1968 library with new wing on left.